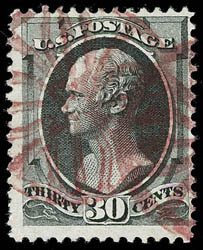 Circular Geometric, two strikes in claret on 30¢ gray black (165), a Very Fine strike in the rare claret color. Weiss No. GE-C5 Estimate $150 - 200. 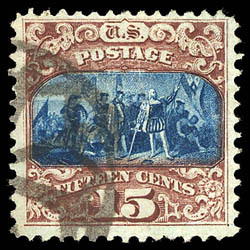 In addition to red, claret was also used by the Supplementary Mail department but is far scarcer. 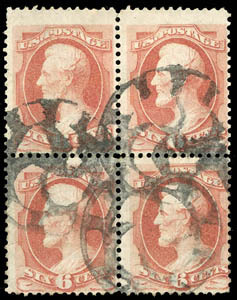 Circular Geometric, three strikes on 6¢ dull pink (159) block of four; corner crease top left, block of 4, Fine and rare NYFM block. Weiss No. GE-C7 Estimate $200 - 300. 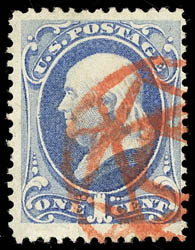 Circular Geometric, bold strike on 1869, 15¢ brown & blue, type II (119), rich colors, wide margins, Very Fine, ex-Koppersmith; with 1988 and 2002 P.F. certificates. Weiss No. GE-EN2 Estimate $300 - 400. A RARE 1870S NEW YORK FOREIGN MAIL CANCEL ON A 1869 PICTORIAL ISSUE. 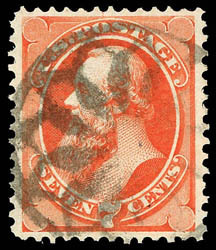 8-Point Circular Geometric, two strikes on 1873, 6¢ dull pink, horizontal strip of three, Very Fine; with 2004 P.F. certificate. Scott No. 159. Weiss No. GE-EN3 Estimate $150 - 200. 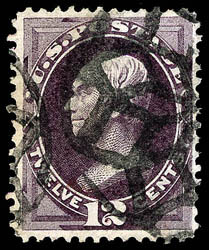 Elaborate Negative Geometric, bold strikes on 12¢ blackish violet (162), well centered, deep color, fresh and Very Fine, ex-Mercedes; with 2004 P.F. certificate. Weiss No. GE-EN4 Estimate $150 - 200. Elaborate Geometric, bold contrasting strike in vivid supplementary mail red on 1¢ ultramarine (156), pretty shade on bright paper, fresh and Very Fine strike, ex-Mercedes. Weiss No. GE-EN8 Estimate $150 - 200. Elaborate Positive Geometric, neat strike on 7¢ vermilion (160), exceedingly well centered within beautiful wide margins, deep radiant color on brilliant paper, Very Fine to Extremely Fine and choice, ex-Mercedes; with 2004 P.F. and 2011 certificates, latter graded VF-XF 85. Weiss No. GE-EP3 Estimate $150 - 200. 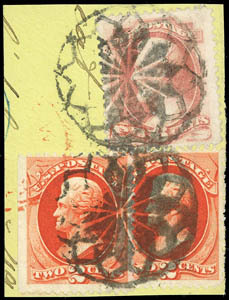 Circular Geometric, two complete strikes tying 2¢ vermilion (178), two overlapping singles + 6¢ dull pink (159) on piece, left 2¢ with natural s.e. at left, Very Fine and choice, illustrated in Weiss (page 117); with 2004 P.F. certificate. Weiss No. GE-EP4 Estimate $200 - 300. 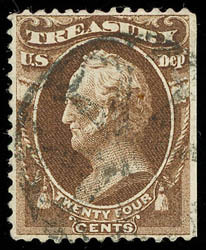 Intricate Positive Geometric, fine strike on 24¢ Treasury (O80), perfs trimmed at right, Fine and rare, light but readable strike of this rare type; with 2017 P.F. certificate with declined opinion as to type. Weiss No. GE-EP13 Estimate $300 - 400. 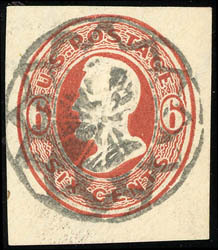 Elaborate Positive Geometric, strong strike on 6¢ carmine (U86) cut square, Very Fine and scarce strike on U86 stationery. Weiss No. GE-EP4 Estimate $150 - 200.